I won’t lie. When I heard about this back in November, I was super-duper excited. Marvel had just announced that their newest hero was going to be a character of colour and of a religion that you really don’t see in comics from the Big 2 all that much. In fact, I’m hard pressed to name any Muslim superhero from either Marvel or DC, other than Marvel UK’s Faiza Hassan from Age of Ultron last year, when she was named as the new Captain Britain or Simon Baz from DC’s Green Lantern titles, an Arab-American who even got put on the US government-sponsored Justice League of America last year. This is a huge, huge step forwards for diversity in comics and I’ve got my fingers crossed that people respond to this with enthusiasm and interest. I would love for nothing more than to see Kamala Khan become a fan-favourite with her debut title. And she is written by G. Willow Wilson, a female writer who is also a converted Muslim. How awesome is that? Representation all the way! Now all that Marvel and DC need to do is create a Hindu character, a superhero, and I’d be happy. Anyways, on to this story. This is Kamala’s origin story and begins the arc that introduces her to the world. We start off with a day in the life of Kamala and we see some of her supporting cast. We see how life is for, whether at home or out in the community. We see how she is often the target for concern trolling and mean comments by the privileged people of society. And then we see her big metamorphosis, as she finally gets what she’s been dreaming of so long. Wilson’s writing is snappy and it hooks you straight in. She gives Kamala a great voice and she conveys the character’s naivete rather well too. Its interesting to see how she is developing Kamala in this debut issue and how she is laying the seeds for her development as a character over time. To be perfectly honest, Wilson’s writing isn’t quite out there as some of the best in the business, but she’s still done a damn good job. And moreover, she’s given us some dialogue in Urdu, the mother language for Kamala’s parents and the language of her religion. How freaking awesome is that. For that alone, I love this comic. When it comes to the art, it doesn’t really stand out all that much. I mean, its good start. Alphona’s pencils are definitive, and everything is quite clear and noticeable, with lots of details here and there, but it didn’t quite click for me all the way. This is the first of Alphona’s work that I’ve seen so I’m certainly open to giving the artist more of a chance. One issue can’t quite cover all the strengths, or weaknesses, of an artist. They need time to develop, and I’m fine with giving Alphona that time to develop with these characters. On the other hand, Ian Herring’s colours definitely won me over, giving the issue a very warm feel that I quite liked. 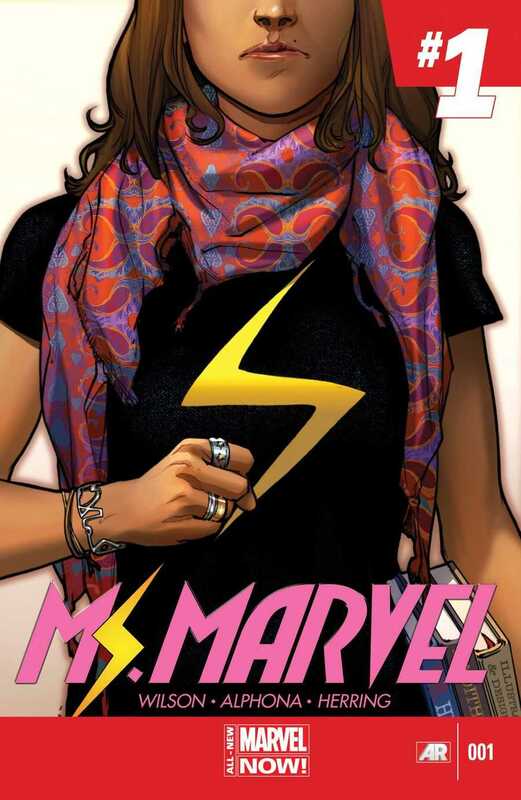 Overall, I think this is a great effort from everyone involved, particularly editor Sana Amanat who came up with the idea of Kamala Khan and a muslim superhero stepping into the shoes of Ms. Marvel. So, great job all around to them! Posted on February 5, 2014, in Comics Reviews, Review Central and tagged Adrian Alphona, All-New Marvel NOW!, Captain America, Captain Marvel, Carol Danvers, Comics, Comics Review, G. Willow Wilson, Ian Herring, Inhumanity, Inhumans, Iron Man, Kamala Khan, Marvel Now, Ms. Marvel, Review, Review Central, Sana Amanat, Superheroes, VC's Joe Caramagna. Bookmark the permalink. 14 Comments. wasnt captian marvells son captain marvel and carol danvers was the original ms. marvel? Yes, I don’t believe I contradicted that here.